I did not learn to play the recorder as a child. My sister did however. She wanted to play the oboe very earnestly from an age deemed to young to begin, and took private recorder lessons for a couple years until she was told she was old enough to move on to clarinet. (She did eventually become a fine oboist.) She had a beautiful wooden Moeck soprano, and I remember the few times I tried to play it (at that age I played piano and horn) having great difficulty finessing the subtle breath required for the tiny instrument, and giving up quickly in frustration. Recorder was not a part of my public school music classes (when I had them). My next experience with a recorder was in an undergraduate music education class, when I was given a cheap plastic soprano and told to learn how to play it and to perform an assigned piece by the next class meeting, along with the rest of the class. None of us were given any instruction. 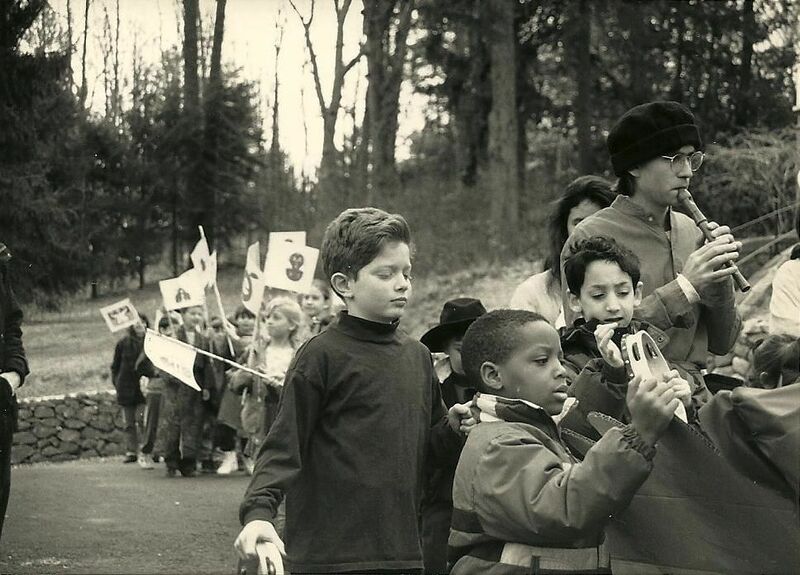 Fast-forward to 1991, when I began my first full-time teaching position at a small private school for grades K-6 just outside New York City. I was tasked with designing and implementing an ideal music program for the school, which was to include both vocal and instrumental music as well as traditional dance. I decided to include a recorder program as the instrumental component of this program, bought a soprano and an alto, and began to teach myself how to play. Quickly I realized that in order to teach recorder well I needed to learn to play it well, and I took my recorder study seriously, seeking out private lessons and other chances to learn from professionals, and attending performances featuring (mostly Dutch) recorder players when they came through town. Luckily I was in New York, where all sorts of opportunities are available that simply don’t exist elsewhere. Also luckily, I was already a trained musician, had learned how to practice efficiently, and was able to develop my technique to the level where I could approach the more difficult (and rewarding) repertoire relatively quickly. I took lessons for several years with Steve Silverstein, a veteran wind player, inventor, and craftsman who has a background in early music and worked extensively as a clarinet and saxophone player. Steve not only played recorder, he had made them (one of the treasures of my instrument collection is a “Van Eyck” soprano Steve made), and he also had extensive experience in the early music field on other wind instruments including cornetto, serpent, racket, crumhorn, etc., and he possessed a vast music library. Not only did I learn how to play the instrument, the recorder (and later, the lute) became for me the key that unlocked the door to hundreds of years of music that previously had been mostly just a silent supposition. My formal music education had included little music before that of our friend Sebastian – most of my experience of early repertoire had been singing a few renaissance pieces in a choir performing madrigal dinners. I was to learn that my entire previous conception of music history (as I had been taught) was severely truncated – our musical tradition didn’t begin with Bach but rather, Sebastian stood at the end of a long tradition replete with a fabulous variety of musical styles, masterpieces, personalities, and instruments – some of which are the forerunners of those of today, and some not, all with their own charms, foibles, and unique repertoires. The recorder’s beginnings date from at least the late Medieval period: the oldest known surviving instrument was built in the fourteenth century. During the Renaissance the recorder developed into a family made in different sizes (and therefore ranges) that utilize basically the same technical approach for each instrument. Unlike most modern violinists or sax players (whose instruments are also made in families of different sizes), an accomplished recorder player is fluent in playing all members of the family, and can switch easily between instruments during a performance. Recorder players playing in consort will typically take turns playing different members of the family during a performance or rehearsal. 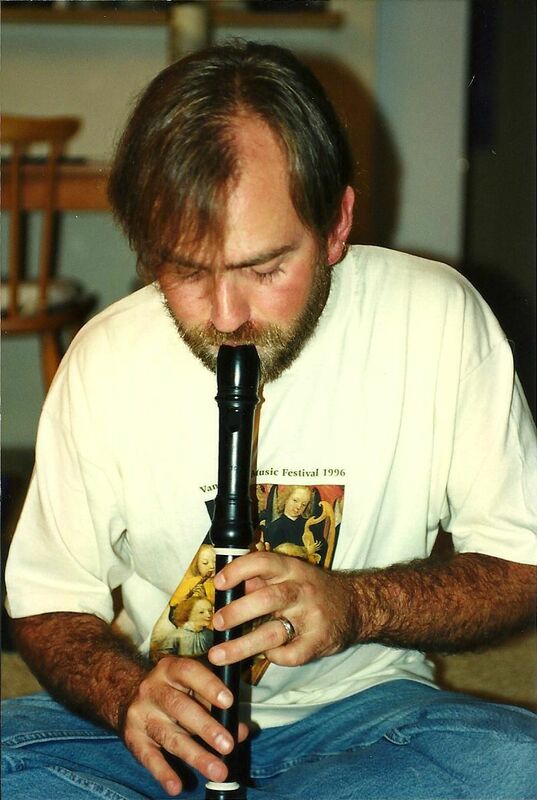 Playing “in consort” was typically what recorder players did during the Renaissance – prevailing tastes in the fifteenth and sixteenth centuries were for instrumental ensembles having a homogeneous sound, and members of one instrument family were most likely to play with others playing instruments from the same family. It was also common for composers not to specify too closely preferences for what instruments were to be used when performing consort music; for example Anthony Holborne’s 1599 collection Pavans, Galliards, Almains, and other short Æirs both grave and light, in five parts is described on the cover as being for Viols, Violins, and other Musicall Winde Instruments. Publishers could hope to generate more sales if the music was accessible by players of more than one instrument, but also composers did not generally write for the specific timbres of individual instruments to the extent composers of the Baroque and later periods would (to which we have become accustomed). 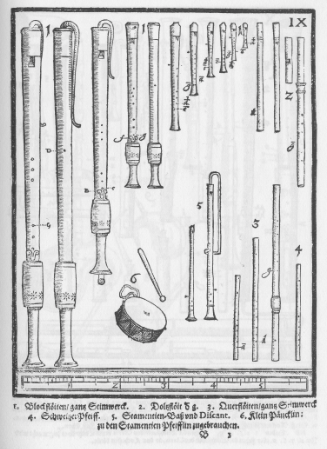 Recorders during the Renaissance were typically made in sets tuned to each other, and were built with a cylindrical bore, usually in one piece. This design allowed the instruments to have a more uniform dynamic throughout their (more limited) range than instruments built later. Renaissance recorders have a strong, full tone which blends well in consort, and it was (and is) common for a consort of recorders to be employed to play music originally intended for voices as well as instrumental music. The popularity of the instrument waned during the early years of the Baroque period but was revived by the end of the seventeenth century for recorders sporting a new design – built in three pieces like the new Baroque flutes, these instruments could therefore be tuned, and featured a conical bore. The new design resulted in a recorder with a bigger range (over two octaves) that played much more powerfully in the high registers than in the lowest part of the instrument’s range. These features were well-suited for the instrument’s primary use as a solo instrument, accompanied by continuo. The first half of the eighteenth century saw the apotheosis of the recorder’s employment in the historical repertoire. Some of the greatest composers of the day included works specifically for recorder in their catalogs, notably Händel, whose six remarkable sonatas for recorder and continuo are perhaps the finest works written for recorder during the historical period, and Telemann, whose output includes more music for recorder than any other composer of the time, from both accompanied and unaccompanied solo pieces, to duets, chamber works, and concerti. J.S. Bach included parts for recorders in various combinations (often in pairs) in some of his cantatas, and famously, wrote parts for them in two of the Brandenburg Concerti. Arnold Dolmetsch, (1858 – 1940), who was born in France but spent most of his life in England, is credited with the revival of the recorder (and within the English-speaking world, many other aspects of the Early Music movement) in the early twentieth century. Recorders are still being made under his name to this day. The instrument was soon appropriated by music education pedagogues for use in school music programs, which ultimately resulted in the inexpensive, mass-produced recorders most people are familiar with. But it is really the Dutch who are responsible for it’s return as a concert instrument. The efforts of Kees Otten (1924 – 2008), led to the elevation of the instrument’s status in the Netherlands, where students have been able to study recorder performance at Dutch conservatories since the 1950s. Frans Brüggen (one of Otten’s students), who died last year, is probably the most important recorder player in history, and did more in his career as a virtuoso performer and teacher to establish the instrument’s integrity on a sound footing with other musicians, composers, and audiences than anyone before or since. In the past fifty years not only has the instrument and its historical repertoire been revived – along with so many others that went into hibernation during the Classical and Romantic periods – Brüggen and his students led the way for its acceptance as an avant-garde instrument, developing extended techniques which have been utilized by many composers of contemporary music for recorder. The United States is still behind much of the world in accepting the recorder – indeed in accepting early music in general – as bona fide. There are few, if any, degree programs where a student can declare a major in recorder performance (or study it at all), and most higher learning opportunities that do exist are at the graduate level, such as Juilliard’s Historical Performance program, established only in 2009. We still have a way to go. 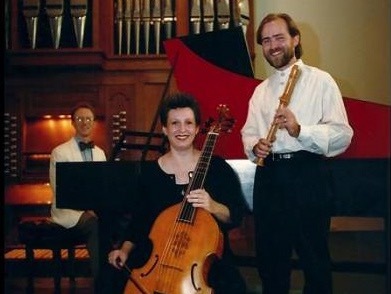 Through the 1990s I was as active as I could be as a performer on recorder and lute, and was fortunate to find other musicians who were also interested in exploring the old repertoire, as well as opportunities to perform regularly as a soloist. As many have found however, earning a living as a performer of early music is a daunting proposition anywhere, and especially in the U.S. I have earned literally hundreds of dollars playing (insert lute or recorder here). After the birth of our second child I set aside ambitions to “make it” as an early music performer and concentrated my energies mostly on my teaching career and family life. When I was employed in K-8 schools I was able to have thriving recorder programs at a couple of schools I taught at for several years. 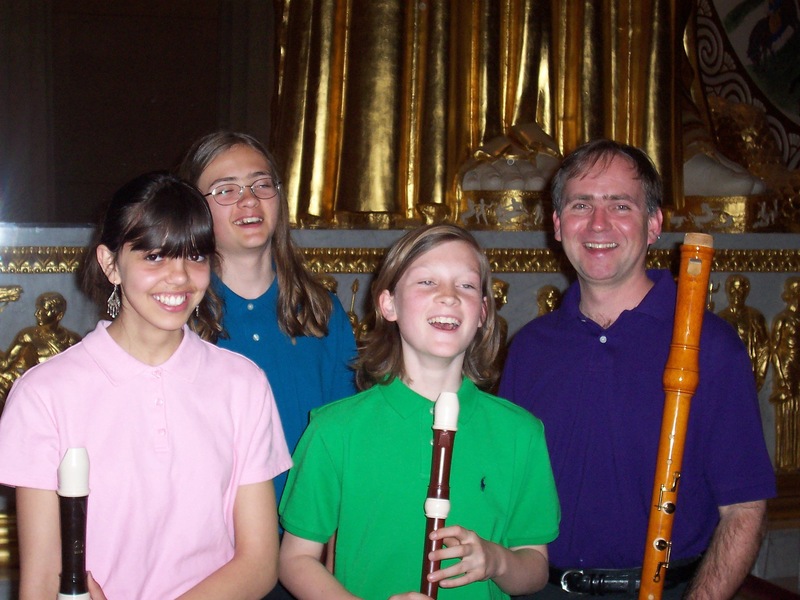 With careful instruction and a supportive environment, children take well to the recorder and are able to achieve remarkable music-making in a relatively short period of time. At each school where I taught these programs most students were capable of playing consort music in four or five parts by fifth grade, with the most accomplished students performing advanced literature such as selections from The Art of Fugue before they hit their teens. When I began teaching high school students in 2007 my opportunities to teach recorder almost vanished as my efforts focused on piano, orchestra and choir, although I did find opportunities to work recorder into my choir programs occasionally. I still manage to find opportunities to keep my hand in – I have played recorder for services at a local church where a friend is music director once or twice a year for many years now, played on a Bach cantata with Music City Baroque in 2010, and generally try to keep an eye open for any excuse to pull out my instruments and work something up for a gig. More importantly, the effort I put into learning how to play recorder and explore its repertoire taught me valuable lessons about musicianship including phrasing, articulation, ensemble skills, a greatly expanded view of music history, and many other aspects of the musician’s craft that I found myself constantly applying in my work as a teacher and conductor. The flip side of the humility that playing the recorder has taught me is a satisfaction I often feel after a performance, when someone whose exposure to recorder music was previously limited to the typical American experience in elementary school approaches me and says something like “I had no idea the recorder could be played like that!”. By walterbitner in Baroque, Early Music, Meet, Music Education, Renaissance, The Recorder on April 18, 2015 . What a cool and informative post. Loved th clips. I was surprised you didn’t mention th theme song to “Taxi”. It food for th recorder what ” Family Affair ” did for th harpsichord! Nice to see a thoughtful article giving recorders their due respect! How about mentioning the local chapter of the American Recorder Society? We’re still going strong! Hi Janet – sure! Feel free to mention information here about the local ARS chapter. Thanks for a fun read and interesting information about the recorder and clips with people of various ages playing wonderful music. There is so much to learn about this instrument and the music written for it. Good to hear a voice from the early music world. Look forward to the next article. Very nice article. I’d say that the recorder still is quite unknown even in Europe. The main problem resides in letting this fact affect those who really love this fantastic instrument. Thank you! I agree, but I also feel it is good for professional players and the recorder playing community to promote acceptance of the instrument among mainstream musicians and their listeners!